A scheme to alert the emergency services to a patient’s vital personal and medical information has been adapted to meet the needs of people with learning disabilities in Doncaster. As a result of the adaptation, people who access Rotherham Doncaster and South Humber NHS Foundation Trust (RDaSH) learning disability services will now be issued with a free plastic bottle to store in their fridge, which is available to the emergency services if they need to attend their home. The bottle contains information on where the person keeps their Traffic Light Assessment (TLA) Hospital Passport – a four-page document that summarises important information about the person to keep them safe and happy while they are in hospital. 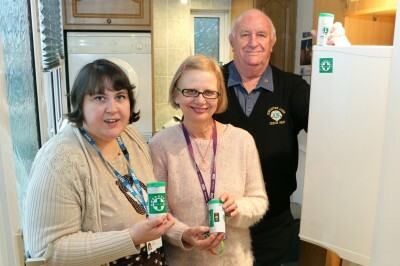 Voluntary organisation Doncaster Lions donated the bottles as part of the Lions Clubs International’s established ‘Message in a Bottle’ scheme, which is designed to encourage vulnerable people to keep their personal and medical details on a standard form and in a common location. RDaSH acute liaison nurse Glynis Smith said: “The TLA has proved to be a great success in Doncaster when people have a planned our routine hospital appointment. “However, in an emergency situation when people are stressed, it can often be forgotten. To address this we approached Doncaster Lions to ask for some of their wonderful fridge bottles, which we have adapted to include the traffic light image on the outside and inside of the pot, indicating where the TLA can be found. Launched by RDaSH in 2012, the TLA’s red rating is for things ward staff must know, such as GP and carer contact details, medical conditions, medication and allergies. Amber is for important issues, such as how the person communicates and shares information, their eating and drinking preferences, as well as their need for help in moving around and taking medication. Green is for likes, dislikes, hobbies and personal preferences as environments, physical touch and routines are very important to people with learning disabilities.